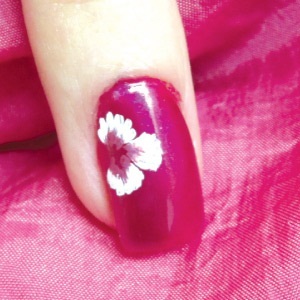 Tina Panariello of Brooklyn, N.Y., shows how to make a two-tone flower design with acrylic paint. SPONSORED CONTENT: Alpha Brush offers a wide variety of brushes for everything from gels to fine nail art. 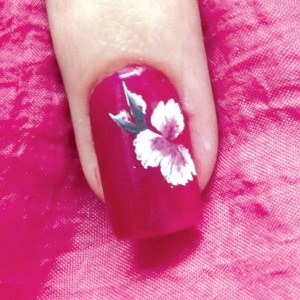 Tina Panariello of Brooklyn, N.Y., has been in the nail industry for over 30 years. 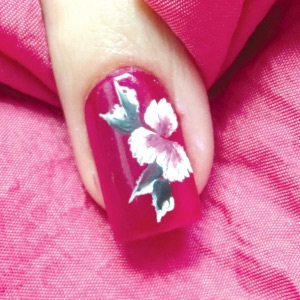 Her miniature artwork has won first and second place in the World International Championship Awards, and Panariello has traveled to places like Puerto Rico and Italy to teach nail art seminars. 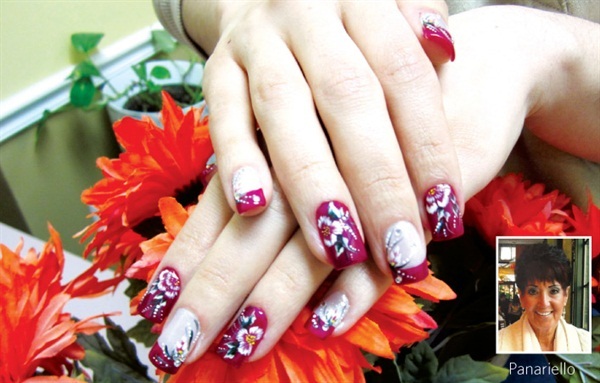 Panariello is currently writing a book about her nail industry experience and life outside the salon that is set to be published in late 2012 by Tate Publishing, LLC. For more information, go to tinapanariello.com. 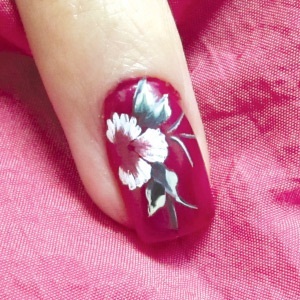 Here she shows how to make a two-tone flower design with acrylic paint. 1. Polish the nail with Essie Sure Shot. 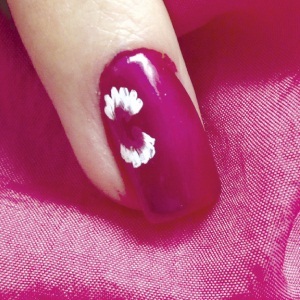 Use a small shader brush with white and fuchsia acrylic paint to blend and paint the top petal. 2. With the same brush, paint the bottom petal. 3. 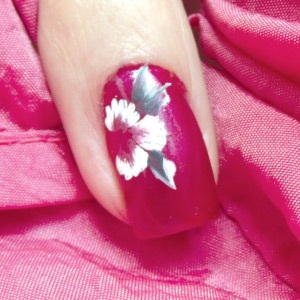 Add more white and fuchsia acrylic paint if needed to paint the middle petal. 4. Use a small shader brush to blend light and dark green acrylic paint. Then paint the first leaf between the top and middle petals. 5. Use the same brush to add the second leaf next to the first one. 6. 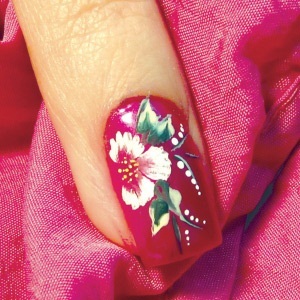 Add more light and dark green acrylic paint, if needed, and add a leaf between the middle and bottom petals. 7. Use the same brush to add a second leaf next to the first one. 8. Use a striper brush with light and dark green acrylic paint to add a few stems between the top and bottom leaves. 9. 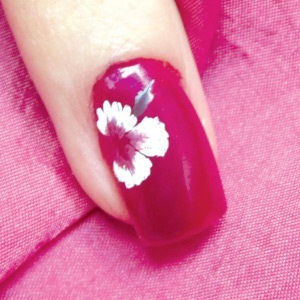 Decorate with a dotting tool for the inside of the flower, and for accents along the leaves.